God’s love is displayed in the cross where He gave himself. God’s love is displayed in the blood He shed for us. God’s love is displayed above all in the sins He took upon himself to cleanse us, providing redemption for the whole world (1 Jn 2:2). God’s love provides light to His creation. God carefully planned and gave light for everything He created in Genesis 1-2. He first created light to sustain life. He is the Light of the World (Jn 8:12). He is the light of life (Jn 1:4). The Lord is our light and our salvation (Ps 27:1). He is the light of men showing us the one true God (Jn 1:4). God’s love provides redemption. Justification by God’s pure grace. We deserve judgment, but are redeemed instead because a loving God submitted himself to death on the cross for our salvation (Rom 3:24; Phil 2:8). His blood shed on the cross redeems us (Eph 1:7). God’s love provides salvation (Ps 9:14). God’s power gives us salvation from the world if we only believe in him (Rom 1:16). Our belief provides righteousness, when we confess our sin we receive His salvation (Rom 10:10). God’s love provides eternal life. Whoever believes in Him has eternal life (Jn 3:15). Some do not think they are worth saving. But God loves us so much that even knowing sinful living, He gave himself for us (Rom 5:8). Where sin ruled life and gave us death and fear of the afterlife, God’s grace gave us His Son, Jesus the Christ who gave himself freely, a perfect sacrifice for imperfect man. 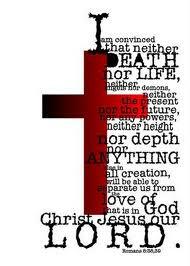 Where there was death because of sin, love provides life eternal through Jesus Christ our Lord (Jn 3:16; Rom 5:21). God’s love is perfect. It is more complete, deeper and more active than any love man can understand. God is a God of love, peace, and comfort (2 Cor 13:11). His love saved you (Is 63:9; 2 Thes 2:10).